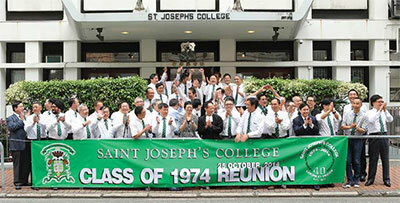 this is a website of, by, for SJC74, primarily boys (now old dudes) who were in SJC f.5, in 1974.
the purpose to assist and facilitate communication between old classmates to strengthen friendship and support. the home page is a portal to direct people to the various components of the website. is this associated with the SJCOBA? we support the SJCOBA but we are independent of them. they are not responsible for any content herein. what is some recent history on this group? with the internet and social media like facebook and whatsapp becoming popular in recent years, it facilitated bounty hunters miguel rocha, jacky ng and patrick siu to track down old classmates all around the globe. getting together for a dinner or two is one thing, being able to connect virtually on a regular basis with a smart phone is priceless. you will be assigned an alias once you are in the system so it will be easy for people to email you too. what are some channels for me to stay in touch? 1| facebook. let us know if you have a fb account and we will add you. 2| whatsapp. let us know what your phone number is and we will add you to our buddies group, please be aware that it is a very active chat group with lots of mo liu stuff so join at your own risk, and make sure you mute the notification when you need some privacy. 3| this web site. participate in the discussion forum so we know what you are up to. 4| email distribution list. we maintain a email maillist we keep everyone informed with broadcast emails. send an email to postsjc(at)lists.postsjc.org and everyone will get it. where do i have to log in? who maintain this web site?